Wawasee building trades students include, in front from left, Michael Sautter, Josh Webber, Mark Graham, Keyanna Clevenger, Brayden Spore, Samuel Griner and Kyle Byrket. In the back row are Hunter Magiera, Jake Keiper, Tanner Hampton, Caleb Bolt, Logan Long, Jordan Roe and Dakota Bruder. SYRACUSE — Wawasee, Fairfield and West Noble building trades students have been busy using power tools, levels, wrenches, screwdrivers, paint brushes and more to build a house at Syracuse Lake. 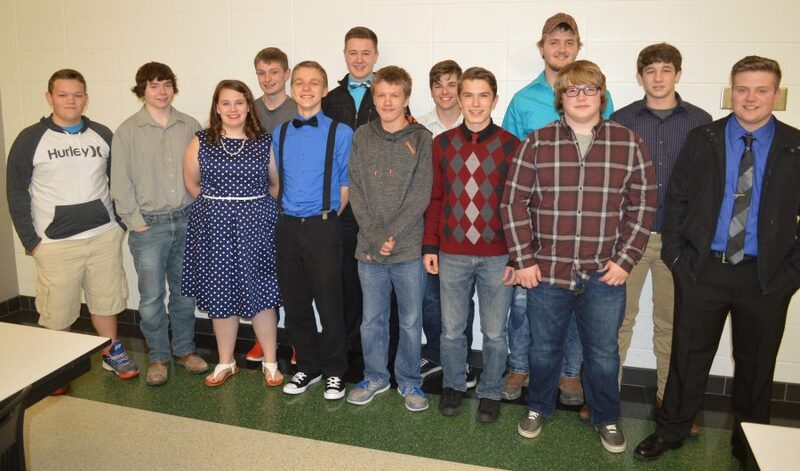 Tuesday evening, May 2, in the Wawasee High School cafeteria, those students were honored during the annual Wawasee & Fairfield Building Trades Banquet. As they have for the last few years, Wawasee and Fairfield teamed up for the project with assistance from West Noble students. Ed Waltz is the Wawasee building trades instructor and Jeff McClure is the instructor for Fairfield. Awards were presented to Hunter Magiera (Wawasee) and BreeAnn Cox (Fairfield) for being the outstanding senior students. Magiera, Sam Griner and Brayden Spore (Wawasee) were presented college scholarships. A maximum of $5,000 will be presented and divided among the three. Cox and Zach Emmons (Fairfield) will also receive scholarships, though the amount has yet to be determined. Several door prizes including screwdrivers, tape measurers, a knife, a level, screw bit sets, a wrench set and a shop vac were presented to several of the building trades students. There are a total of 31 students participating in building trades among the three schools. Wawasee has 14, Fairfield 11 and West Noble six. Wawasee students include Dakota Bruder, Kyle Byrket, Keyanna Clevenger, Mark Graham, Tanner Hampton, Jake Keiper, Caleb Bolt, Samuel Griner, Logan Long, Hunter Magiera, Jordan Roe, Michael Sautter, Brayden Spore and Josh Webber. Fairfield students are Eric Bontrager, Jediah Corbin, Tanner Hunley, Zachary Miller, Curtis Nisly, Tristen Ritter, Cristofer Schrock, Dakota Williamson, BreAnn Cox, Joshua Springer and Zachary Emmons. West Noble students are Cade Barhydt, Andrew Hagerman, Kristopher Kiser, Noah Swartz, Chase Wroblewski and Aaron Miller. Prior to the awards and recognition portion of the banquet, a meal was provided by culinary arts students led by instructor Dan Bauer. The project house at Syracuse Lake will be open to the public from 3 to 7 p.m. Wednesday, May 24. Address of the home is 13237 N. East Shore Drive, Syracuse. For more information, call (574) 457-3147, extension 2209. Fairfield and West Noble building trades students include, in front from left, BreAnn Cox (Fairfield), Curtis Nisly (Fairfield), Cristofer Schrock (Fairfield), Jediah Corbin (Fairfield), Kristopher Kiser (West Noble) and Aaron Miller (West Noble). In the back row are Eric Bontrager (Fairfield), Tanner Hunley (Fairfield), Josh Springer (Fairfield), Zach Emmons (Fairfield), Dakota Williamson (Fairfield), Andrew Hagerman (West Noble) and Chase Wroblewski (West Noble). Not pictured are Zach Miller (Fairfield), Tristen Ritter (Fairfield), Cade Barhydt (West Noble) and Noah Swartz (West Noble). 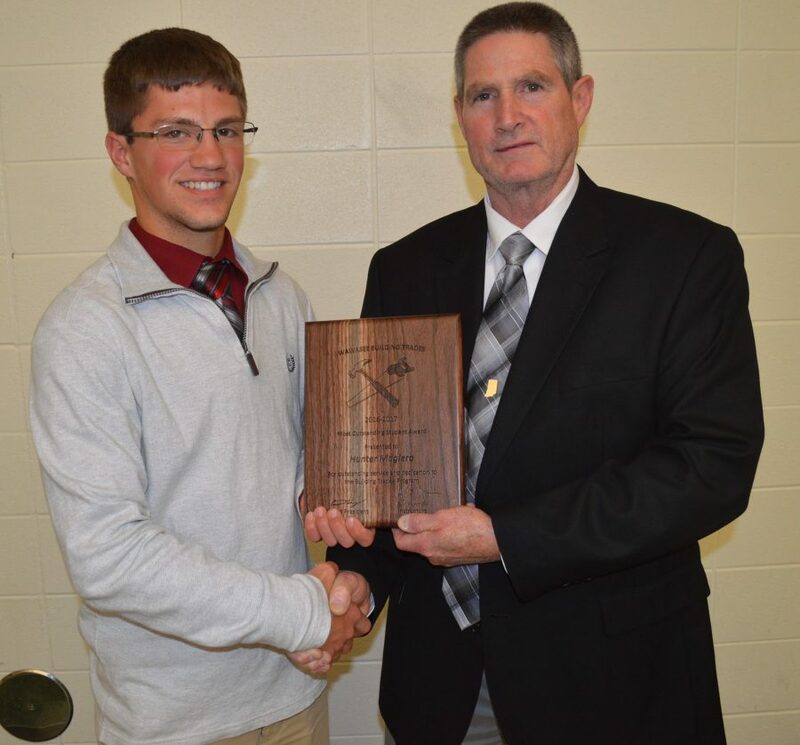 Hunter Magiera, left, of Wawasee High School, was named the outstanding senior during the building trades banquet. Shown with him is Ed Waltz, Wawasee building trades instructor. 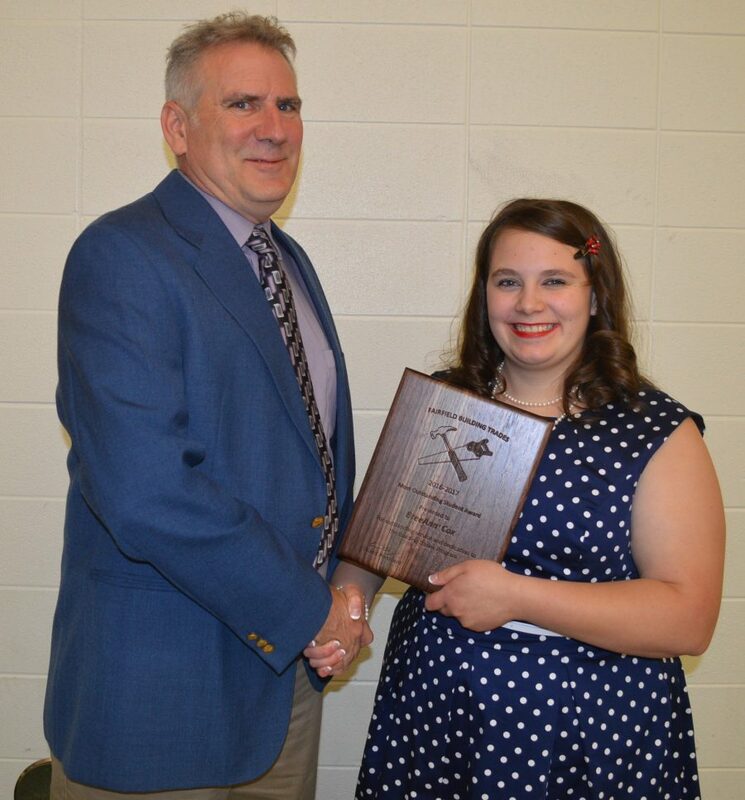 BreeAnn Cox, right, of Fairfield High School, was named outstanding senior student during the building trades banquet. She is pictured with Jeff McClure, Fairfield building trades instructor.